One thing I absolutely love about autumn is the busyness of the squirrels in the wooded park across the street. I have a habit of naming wild animals and thereby claiming them as my pets. Since moving to my present home, this practice no longer applies to squirrels. There are just too many of them! I can’t look out the window without seeing one. I can hardly pull out of the driveway without having to avoid one. Their population seems to double in the fall, and every single one of them seems to be running somewhere with a nut in his/her mouth. I’m in heaven! It seemed only fitting that when I was thinking of a craft to make with the supply of acorn tops I recently collected from a trip to Ontario Canada’s “Cottage Country,” a silhouette of a squirrel popped to mind. And so, the “Acorn Top Squirrel” was born. Here’s my collection of acorn tops. What a find! Using CorelDraw, I drew up a silhouette of a squirrel that maximized the space available in my frame. The tail had to be big… it’s a squirrel’s most elegant feature! I then printed, cut, and traced it onto the support board that came with my $2 yard-sale-find frame. I left the board alone as the kraft colour had a natural woodsy feel to me. But a great alternative might have been to first wrap the board in a lovely fall-themed geometric print fabric or even a mustard yellow and white chevron print. I then painted out the shape with a dark brown craft paint and waited for it to dry. Next I glued the acorn tops in place. I was glad to have had the foresight to collect a lot of small acorn tops as well as large ones, as it made it easier to fill in spaces and hug the lines. 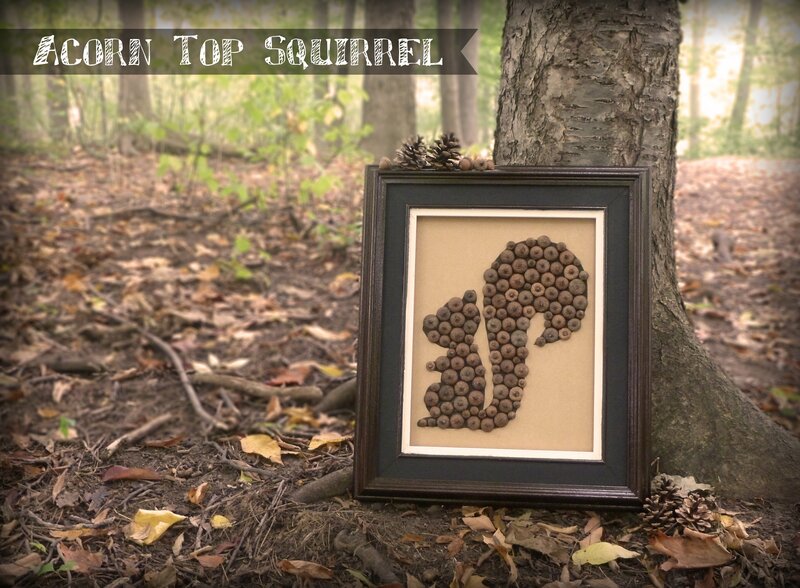 My squirrel found a great home in a freshly painted frame and, voila… my Acorn Top Squirrel Silhouette! Now where to put it…? You are so talented Tina! I Love this! I am doing a woodland themed baby shower for my cousin and this is perfect! Thank you for sharing! I also just bought the felt woodland creatures pattern from your etsy shop, I can’t wait to get started on them!!! What kind of glue did you use? I’m gathering the acorn caps, but I’m trying to figure out the best way to keep them glued on the board. Love this idea! It’s been a couple years since I did this project so I did not remember right away, but I can see on the edge of one of the pictures a bit of a glue bottle, and it is simply school glue. If you have craft glue, that would probably be even better — whatever dries clear. I don’t like the stringy mess of glue guns, so I tend not to use them for anything. Is that an 8×10 or 11×14 frame? I love it! It was an irregular size thrift shop find. The opening is about 10 x 13″.